She wants to remove date picker from the right of Date of birth field in a flow (i.e. Student Registration Form). Note: – If you want to display Next or Finish button at the bottom or top of the page then use buttonLocation=”bottom” or “top”. 2. The next step is to apply cascading style sheets, to remove the date picker. Use the following style sheet to your Visualforce page. Finally, it will look like the preceding screenshot, after hiding the date picker from Date of birth field. Business Use Case 2: – Now she wants to apply Color: Green, font-family: Courier New to Date of Birth and Communication Address fields of the existing Student Registration Form Flow. Edit the Visualforce page to incorporate the below mention CSS. 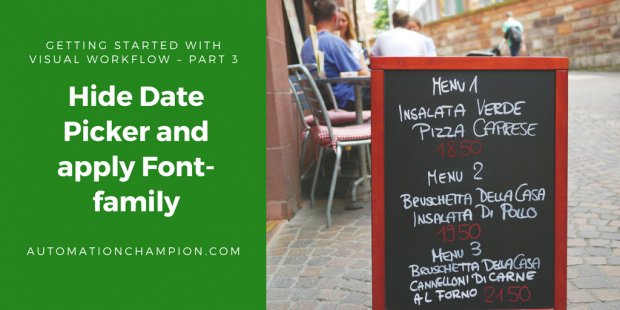 Where FlowDate and FlowTextArea are Flow Style Class for Date field label, Text area field label respectively. I am using below code to remove date picker but still showing data picker in view. How do you get your flow input elements to space out? All of mine always show up next to each other. How do you get your input fields to have spacing between them? All of mine clump together, one right on top of the other. This CSS will make all the other Date field and TextArea field on my flow on same style right? As usual great article Rakesh.